Is running an obstacle course with your dog something you’ve only dreamed about? Or is it a matter of tapping into your dog’s abilities to reach your goals? 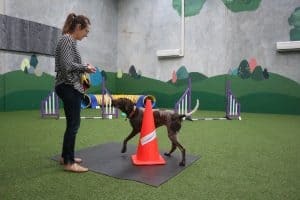 Kalmpets offers dog agility training for dogs at all levels using the same agility training methods our day care manager has used successfully with her own dog. Every type of competition begins with mastering the basics. Our approach to dog agility training is yours’ and your dog’s introduction into the world of agility. We help instill the foundation for a bright and confident future that comes from a well-trained dog. If you and your dog have already started in agility, our day care manager can help you advance. Her passion for the sport and natural abilities make her the ideal trainer to help dogs get to the next level. She had the express honour of representing Australia in the World Agility Open Championships in 2016. Kalmpets agility training is your opportunity to learn from Sarah’s knowledge and skills. Lessons begin at the age of 12 weeks and include adult dogs that have or have not previously engaged in agility course training. It’s just one more way that Kalmpets brings you more opportunities to enhance your dog’s life and create a calmer, happier canine family member. The most successful dogs and their handlers combine speed and accuracy to maneuver the obstacle course like champions. Important skills need to be developed at each level from the time the dog begins training until reaching his first championship event. You can count on us for the highest level of training to help ensure your dog makes the most of his talents. 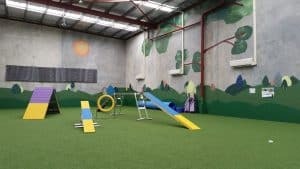 We also know how to make your dreams of enjoying the agility course into a reality for you and your dog. Contact Kalmpets to learn more about course times and to sign up for our next round of lessons. Our realistic approach to training gets real results. Whether you want to train your dog or change a problem behaviour, success starts by understanding your dog. Our unique training program will help him achieve his potential so both of you can enjoy more of your time together. Isn’t that why you wanted a dog in the first place? The four lessons are 30 minutes each and are run either weekly or fortnightly apart, it all depends on how much time you have to put into the homework I give you. Lesson times are currently on Tuesday and Friday afternoons. The four lessons cost $250 (payable at the first lesson) and this also includes unlimited email feedback and critiquing of short videos if you get stuck whilst doing your homework. The homework involves short 3-5 minutes sessions per day. Class starts at 6.30pm Tuesday evenings (set up from 6.15) until 7.15pm . 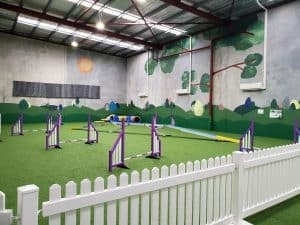 Classes are held in our Kalmpets Canine Sports Academy Arena. Already train in the sport? I offer casual lessons also where you can choose what skills you would like to work on and refine. Skills can be of all levels and all equipment. We have access to all contact equipment (height adjustable), 2 x 2 weave poles, jumps and tunnels. For further information on what other classes we offer, head over to our Dog Training Courses page. The more information on our agility classes and to see what is happening in the Kalmpets Canine Sports Academy pop over to our FACEBOOK PAGE.